Cheese lovers, you’d cheddar get ready. There’s a new restaurant opening in Brisbane – and it’s a gouda one. 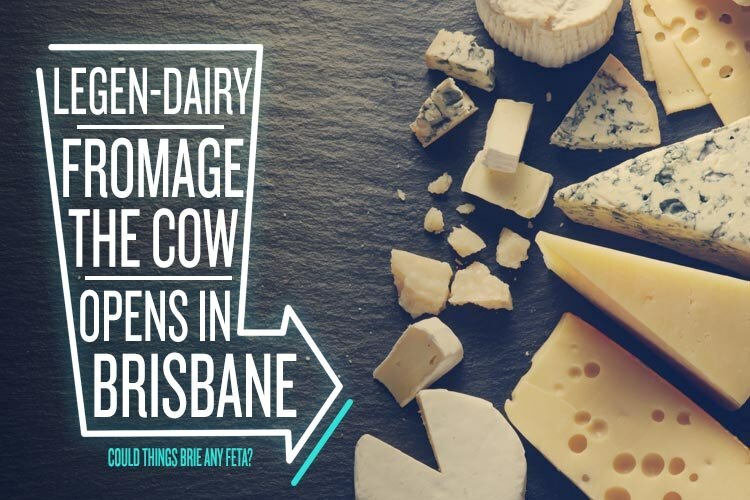 Fromage The Cow is the city’s first ever fromagerie, and it will make all your cheese dreams come true. The project is the handiwork of French expat Tony Launay, and it will feature a full-service, cheese-oriented restaurant. Yes, every menu item will be based around cheese – can you brie-lieve it? There will also be a bar where your favourite cheeses will be paired with wine, beer and sake, and a takeaway coffee window serving epic cheese toasties. From a classic three cheese and ham to truffled mushroom and gruyere on rye, fromage fanatics on the go will be in cheesy heaven. But the piece de resistance will definitely be the walk-in cheese room, where guests can sample dozens of cheeses from all over the world. It all sounds so good, we camembert-ly even handle our excitement. We had a chat to Tony, aka. “The Big Cheese”, to learn more. Hi Tony, thanks for taking the time to chat to us. How did you come up with the idea of opening a fromagerie? It was a group decision. We all felt that it was a player missing from the Brisbane dining scene and, as I’m French, it seemed a natural fit. You’ll be housing more than 80 cheeses from around the world. It must be hard to pick, but which cheese is your favourite and why? Wow! Difficult! For eating, I love a mature Brillat Savarin or a delicate fresh Chevre. For cooking, it’s hard to go past a Compte, which is amazing in fondue. All your menu items will be focussed around cheese. Can you tell us a bit more about what we can expect? It will certainly be cheese-oriented, but it will be balanced. A breakfast may be a spiced poached pear with sweetened buffalo curd, warmed grains and roasted nuts. A main dish may see a slow-cooked lamb shoulder atop a bed of soft taleggio polenta with a spicy arrabiata sauce. Where do you source your cheeses from, and how do you decide which ones make the cut? We source our cheeses from a variety of suppliers so that we can obtain cheeses from around the world that all offer something a little unique. Deciding on which ones make the cut is simple – is it delicious? If it is, then it goes in the cheese room. We’re also really excited about the wine bar with matched cheese flights. What’s your favourite cheese and wine pairing? Right now, we’re loving different concepts, such as beer and cheese (think a pale ale and a blue) or more delicate pairings such as a rose with a semi-hard goat’s cheese. The fromagerie’s centrepiece will be an impressive glass-walled walk-in cheese room. Who designed the space and where did you find inspiration for the layout? It was a part of an ongoing discussion over several weeks between our architect Colin Lewington of Project Designs, our refrigeration specialist from Advanced Refrigeration Technology and our gigantic Pinterest board. When you’re in the mood for something non-cheesy, where do you love to go for a good meal in your area? We love superb Italian from 1889 Enoteca in Woolloongabba, or the steak at Embers Steakhouse just near us in Milton. Fromage The Cow will be opening in late May at 14 Park Road, Milton. Make sure you follow their Facebook page to get the latest updates!